My family has made this Waldorf salad recipe for as long as I can remember. It is a family tradition, that still stands today, that we would prepare this recipe as part of our Thanksgiving menu. And I can remember making this at least once during the summer months as our contribution for group picnic. Classic Waldorf Salad served over a bed of lettuce. Growing up I would always help my mother in the kitchen. I was the master at peeling potatoes. But when it came to Waldorf salad it was my job to cut each grape in half lengthwise and remove the seeds. Yes, the grapes back then all had seeds. And looking back, my job would have been a lot better if seedless grapes were available. 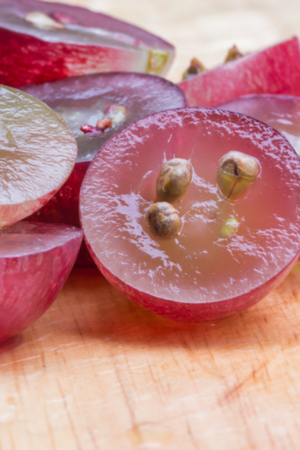 I used a small appetizer spoon to scoop the seeds out of each and every grape. I was very careful, inspecting every grape half to be sure that I didn’t miss any. My biggest fear was that someone would bite into a seed and/or end up choking on one and it be my fault. Before seedless grapes were readily available it was my job to remove the seeds. But to be honest, by the end of the chore, I was a little less careful about removing every little seed. This was a very tedious task and as a young girl the novelty of helping in the kitchen quickly wore off. When I got older and began making my own Waldorf Salad recipe, I began to question the name of this popular dish. I knew that we typically used apples, celery, grapes, raisins and walnuts to make up the salad and then tossed it in a layer of mayonnaise. However, I couldn’t figure out where the name Waldorf came from. So I did a little investigation and found out that this recipe originated in the famous Waldorf-Astoria hotel in New York. This recipe dates back to the 1890’s and originally consisted of only apples, celery and mayonnaise. Use at least two different varieties of apples in your salad for the best flavor. Since then, there have been several variations, but each one is still considered a Waldorf salad recipe. The recipe posted below includes the ingredients that we use in our salad. But others have substituted grapefruit, pears, pine nuts, dates, dried cherries, dried cranberries and more to make it the way their family would like it. To make things a little healthier, I now substitute the mayonnaise with Greek yogurt, or at least a portion of it. And if I am feeling real adventurous I will add in a little Cajun seasoning. Typically, Waldorf salad would be served on a bed of lettuce. However, we have always served it as more of a side dish. The dressing is made of mayonnaise and/or Greek Yogurt. 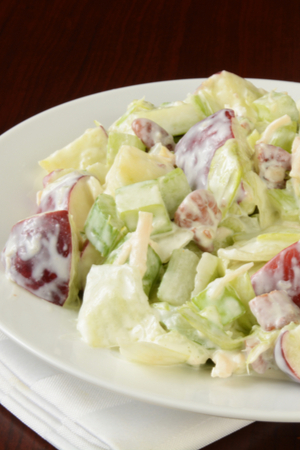 Whatever you choose to add to your Waldorf salad recipe and whether you eat it as a salad or side dish, I am sure that you and your family will enjoy it just as much as we do. Crispy apples, crunchy celery and walnuts and grapes tossed in a creamy dressing that makes for the perfect salad or side dish for any occasion. 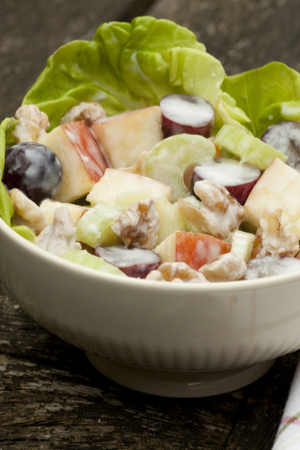 I prefer to eat this Waldorf Salad recipe as a side dish. 1. In a large bowl, toss apples with lemon juice. 2. In a small bowl mix together the mayonnaise/Greek yogurt and cinnamon. 3. Add the celery, walnuts, raisins with the apples and gently stir in mayonnaise/Greek yogurt and cinnamon dressing. Crispy apples, crunchy celery and walnuts and grapes tossed in a creamy dressing that makes for the perfect side dish for any occasion. 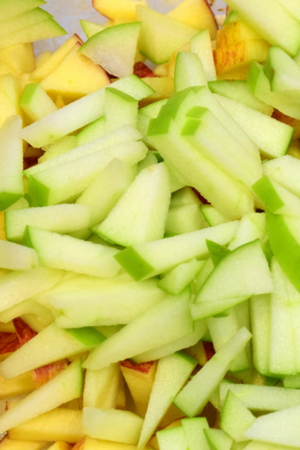 In a large bowl, toss apples with lemon juice. In a small bowl mix together the mayonnaise/Greek yogurt and cinnamon. 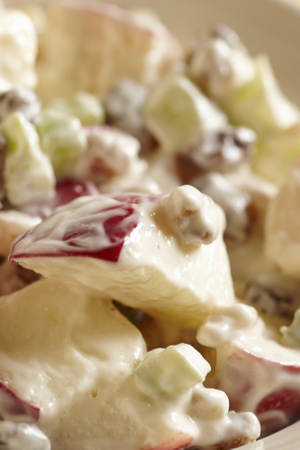 Add the celery, walnuts, raisins with the apples and gently stir in mayonnaise/Greek yogurt and cinnamon dressing. ← Instant Pot Thanksgiving Recipes! Delicious Time & Space Saving Magic!